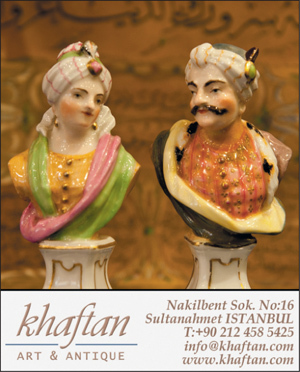 Iznik production was undoubtedly one of the greatest achievements in the history of ceramics. The quality and ambition of the potting, the great range of attractive designs and the brilliance of the colours should all be celebrated, and once every few years a book appears that fulfils that aim. Ömer Koç’s collection is so large and varied, and the new catalogue of his collection produced to such high standards, that its publication matches the eminence of the subject. Ömer Koç began to form his holdings in this field less than 20 years ago, but by 2009 he had already acquired 200 pieces, which were shown in an exhibition at the Sadberk Hanım Museum in Büyükdere on the Bosphorus, along with items drawn from the museum’s own collection. The catalogue of this show, Dance of Fire: Iznik Tiles and Ceramics, also by Hülya Bilgi, was a hefty volume, but it pales by comparison with the new book. The collection is now more than a third larger, and the new catalogue is even bigger, more richly illustrated and better designed – and, of course, heavier, at some six kilos. Book reviewing has become a form of weight training. The collection contains some vessels and tiles from the early-to-mid-16th century, but its strengths are in the material from the late 16th and 17th centuries. As a result, most pieces display the bright red that is one of the finest achievements of the Iznik potters. In terms of vessels, production in this period consisted of series with related shapes and patterns, rather than individual masterpieces, and the collection is presented in groups with similar decoration. They are all of relatively modest proportions: among almost 200 dishes of various sizes and profiles, only very rarely do they exceed 35 centimetres in diameter. Compositions with flowers and the occasional tree predominate, but there are also dishes with metal vessels included in their designs, others with garden pavilions, a larger series of vessels decorated with ships, dishes with human figures, and a bottle and four dishes with coloured grounds scattered with animals, which are followed by late items with coloured animals on white grounds. In many wares, this would give rise to a dull book, but not here – the variations achieved by the painters are so great that the sequences are entertaining for the eye. The same is true of the decorative schemes to which Ömer Koç’s tiles once belonged. The scholarship on display is sound in most respects, but it has barely moved on since the publication of Nurhan Atasoy and Julian Raby’s Iznik: The Pottery of Ottoman Turkey in 1989. The rise and fall of Iznik ware are presented, too, as a self-contained story, as though international factors played a very small role. There are, it is true, no fewer than six dishes decorated with a bunch of grapes, copied at first or second hand from Chinese porcelain dishes of the 15th century, and an appendix illustrates more than 30 European copies of Iznik tiles and vessels made in the 19th and 20th centuries. But the ebb and flow of production elsewhere had a major effect on the history of Iznik, and this is underplayed. At the end of the essay on tiles, for example, we are told that tile production ceased because “tile decoration went out of favour” towards the middle of the 18th century. Why, then, does the Hünkâr Sofası (the imperial reception hall) in Topkapı Palace, which reached its current form under Selim III (1789–1808), have large panels of Dutch tiles? The story of Iznik is very dynamic, but its dynamism is not truly comprehensible when the links to other ceramic stories in the Middle East, China and Europe are omitted. Indeed, the unique character of Iznik arose when Ottoman artists and craftsmen reformed a tradition of blue-and-white wares based on Asian models by drawing on quite different European ideas of design and colour. Underplaying international connections is not, though, a fault peculiar to this book, or to the study of Iznik ceramics. It happens whenever decorative arts traditions are extolled within a national framework. Try getting a specialist in French ceramics to admit that Iznik or Iranian fritware provided the conceptual model for soft-paste porcelain! The unique character of Iznik is amply demonstrated by this magnificent catalogue, in which all the pieces are photographed individually, but which also includes pictures of the way the huge collection is displayed in Ömer Koç’s home. The massing of the dishes and tiles on the walls shows a pride and delight that are entirely justified. The greatest regional response to Iznik production came from Syria, where tilework traditions on the Ottoman model emerged in both Aleppo and Damascus; the latter also produced large numbers of Iznik-style vessels. The tile production of Damascus, and to a lesser extent of other centres, is the subject of Arthur Millner’s new book, which consists of five discursive essays, including three on “The Mamluk Period”, “The Ottoman Period” and “A Western Craze for Tiles”, followed by a catalogue described as “An Anthology of Damascus Tiles”. This last section contains 148 examples of dispersed tilework in private collections and museums. The great strength of this book is the images, which allow us to see buildings that are now unattainable because of the civil war, and which in at least one case – the Khusrawiyyah in Aleppo – have been completely destroyed. With the “Anthology”, it also brings together the dispersed material in a very useful way. A subject that has been at the margins is brought centre stage. Nevertheless, our gratitude for the great effort and cost involved is undermined by the uneven nature of the text. To give one example, we are told on page 124 that the tiles on the Tekkiye Süleymaniye in Damascus, built in the 1550s, are very close in design to those of the mosque of Selim I in Istanbul, built after his death in 1520. According to Millner, a link is provided because both buildings were designed by Sinan. No, they weren’t! This is a scissors-and-paste approach using very poor glue. It is clear, too, that Millner learned from the website of the Victoria and Albert Museum in London that certain types of tile in the museum’s collection are from the Çinili Hamam in Zeyrek, Istanbul, built in the 1540s, and he rightly makes a link with tiles made in Damascus in the following decades. But he does not credit the website, as he should, and he made no enquiry as to where the information came from. This would have yielded two important points. One is that there are other tiles in his book that are also from the Çinili Hamam (as are several in Hülya Bilgi’s catalogue). The second is that the link between these tiles and the Çinili Hamam is the result of the toil of Charlotte Maury at the Louvre and the team of archaeologists and architects now working on the excavation and restoration of the hamam – hard labour that he does not credit. This is not plagiarism, as the information is publicly available, but it shows a lack of scholarly rigour and generosity. Despite these stern caveats, the book contains a lot of information that it is useful to have in one place, and it is already playing a role in focusing attention on Syrian tilework. Indeed, I have already cited the publication in an article on Ottoman tiles because of the new links Millner has established. He ends with a very surprising image, of a tile (V&A: 530-1900) that shows a pretty serving woman holding a bottle and a wine cup (not a youth drinking, as the caption states). The museum website previously attributed this item to Iran in the 17th century, but Millner rightly re-attributes it to Damascus. He does not explain, though, why only one tile with a human figure should have been produced there during a whole century: there are no parallels. The answer is surely that the tile is not 17th-century, but was made in the later 19th century in response to the huge demand for anything that looked vaguely Safavid. It is a fake.